INTRODUCING EcoBake high quality and durable loaf baking pan set that will you a wonderful cooking experience! Have you been looking for the best rectangular baking cake pan that is sure to give a healthy meal always? Search no further, you are at the right place. Our baking pan is perfect for home-baked gifts and commercial bakeries. It is used to line cookie sheets to prevent baked products from sticking to the pans and cookie sheets. The uses of this baking pan is beneficial because it eliminates the need to grease baking pans. You will never have a hard time using any of our baking pan sets. It is designed in such a way for your convenient and stress free usage. They work great with Pumpkin Bread, Banana Bread, or Lemon Drizzle cake. Any tea cake or loaf cake recipe can be easily baked in them perfectly. All our set of portable baking pan are environmental friendly, biodegradable and easy to recycle. It also serves as the best gift idea to any cook. ★MADE IN JUST THE RIGHT SIZE: You will never go wrong with this high quality set paper baking loaf pan. It is made in just the right size for a portable and durable usage. 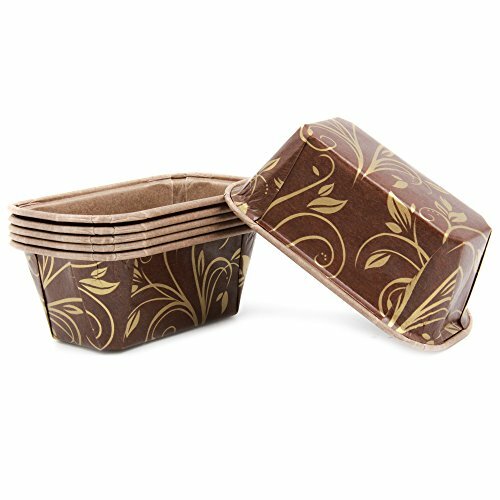 This chocolate cake loaf pan has a DIMENSIONS: 3.15/1.58"B x 1.58"Sw x 3.94/2.16"T. It will hold perfectly 50g of Baked Product. ★DURABLE AND UNMATCHED QUALITY: With this durable baking pan you can cook or bake your food at any temperate without worrying about the paper getting burnt. To get the best experience, we design this baking paper in the form of flat or corrugated paper sheets. ★PERFECT FOR MICROWAVES & OVENS: Unlike others, this durable paper baking loaf pan has a very classic and strong look. You can easily use this baking paper in the oven at fairly high temperatures without the risk of starting a fire. You can also use this baking paper in microwave ovens, unlike tin foil. ★100% SAFE FOR EVERYDAY USE: You and your family are sure to get a more safe and healthy meal with this baking pan. It is perfect for cakes and toasts. This baking pan is environmental friendly; it is biodegradable and easy to recycle. This is the perfect option for baking muffins and cupcakes. ★100% SATISFACTION GUARANTEED: As a brand, we believe in quality not quantity! All our paper baking loaf pans are sure to give you the best experience, you can easily use it as a non-stick and disposable surface. We aim to give you the best or you get a refund.